Make 5V battery source capable of delivering 12V. By using this circuit you can make 12Volt from a 5volt battery. 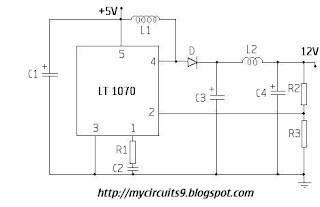 It is a very useful circuit for almost all electronics applications. Most of the circuits that we discussed so far is powered by 12V battery source. 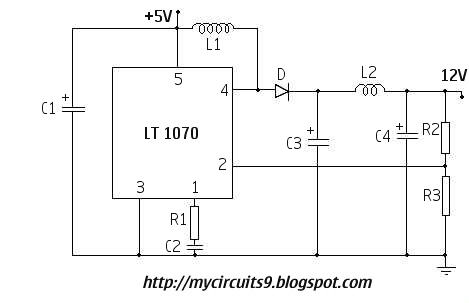 Sometimes you may find difficult to get a 12V source, in such cases you can use this circuit with a 5V source. This circuit is simple to construct, cheap and efficient. Ic LT 1070 is the heart of this circuit. It is a linear Technology switching regulator, commonly used for buck boost and switching applications. The inductor L2 and capacitor C4 forms an output filter, which eliminates the excess ripple voltages from the output. From this circuit, by an input of 5V, you will get an output of about 12V, 1A. It is transformer less step up voltage circuit. Due to the absence of transformer the circuit is compact and cheap.